A team of MIT researchers has developed a new, less chemically-invasive way to separate oil from water that could be used to clean up oil spills in the future. 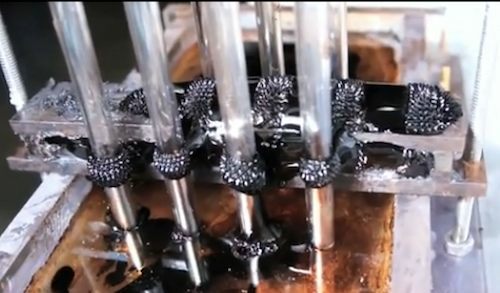 The method, which magnetically separates the two substances, is said to be so efficient that the spilled oil is still usable once it’s pulled from the water. The team of researchers mixed water-repellent ferrous nanoparticles with the oil, which was later separated with magnets. Once the nanoparticles were magnetically removed from the oil, they were able to be used again to repeat the process. The separation system is made into a branching channel with magnets along one side. If there is no oil in the water, it will naturally flow down both branches. If there is a small amount of oil, a lot of water will flow down the branch intended for oil. If there is a high concentration of oil, a lot of oil will flow down the branch intended for the water. While curiously simple, this is highly effective in separating oil from water. The team plans to test out the process at sea for a few days or weeks at a time to determine how well it holds up with a lack of electrical power or maintenance facilities. If it goes well, it could greatly affect oil clean-up to prevent excessive damage in the event of a big spill. Of course, it would be better not to have oil spills in the first place but, obviously, they do happen. Image: snapshot from video: Oil being magnetically separated from water.